INSTRUMENT SPECIFIC NOTE / CONDITION: No bridge; No Bow - Good: Some wear but fully operable. Instrument has been well cared for with no repairs necessary. DESCRIPTION: C...moreonstruction: Maple and Spruce wood used for body, neck, bridge and scroll. Ebony and Boxwood, Rosewood for smaller parts (pegs, inner supports, etc.). Tailpieces and chin rests are a variety of Ebony, generic hardwood and plastic/fiberglass mix with wither plastic or metal fine tuning mechanisms. Some of these auxiliary parts have been replaced and may include high grade plastic pieces. Strings are predominantly Prelude, with Red Label and Snowball also used. Bruchner student instruments are some of the most robust student violins/violas/cellos made, which is why they comprise the vast majority of our rental and gently used inventory. Their baseline student instrument (which is all that we are auctioning) are considered a 'step-up' compared to the vast majority of student instruments that are largely machined processed. Bruchner violins are white-body instruments finished by hand. Condition: - Strings: Variable condition, but operable. - Bow: If a bow is included (most include bow, however, pricing does not include bow) it will be a variable condition ranging from fair to Good. Please see additional comments. - Case: All cases have been included at no additional charge. Cases will vary in condition from poor to Good. Please see additional comments. RENTAL DISCLAIMER: Rental: Instrument was rented more than once. All rental instruments were maintained and repaired by certified master technicians with 30+ years of experience. All rental instruments being sold were regularly maintained by a full time staff of professional technicians and are all in operable/playable condition. 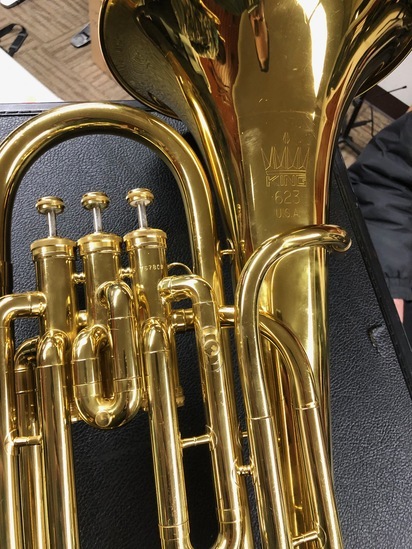 For many of our hundreds of rental instruments, pictures were taken of 1-3 instruments and represent many instruments of the exact same make, model and condition. Buyer should be aware that the picture in featured for their rental instrument may be that of the actual/exact instrument, or of an identical instrument of the same make, model and condition. For example, pictures were taken of 1-3 half-size Otto Bruchner rental violins in Good condition and were used to represent many other Otto Bruchner half-size violins in Good condition. Normal but varying wear and tear commensurate with the condition designation (0-3) should be expected but markings may not be identical to the ones seen in the picture. It is incumbent upon the buyer to read all notes and descriptions. INSTRUMENT SPECIFIC NOTE / CONDITION: - Great: Little wear and fully operable. Used/rented very few times. DESCRIPTION: Construction: Maple and Spruce wood used for body,...more neck, bridge and scroll. Ebony and Boxwood, Rosewood for smaller parts (pegs, inner supports, etc.). Tailpieces and chin rests are a variety of Ebony, generic hardwood and plastic/fiberglass mix with wither plastic or metal fine tuning mechanisms. Some of these auxiliary parts have been replaced and may include high grade plastic pieces. Strings are predominantly Prelude, with Red Label and Snowball also used. Bruchner student instruments are some of the most robust student violins/violas/cellos made, which is why they comprise the vast majority of our rental and gently used inventory. Their baseline student instrument (which is all that we are auctioning) are considered a 'step-up' compared to the vast majority of student instruments that are largely machined processed. Bruchner violins are white-body instruments finished by hand. Condition: - Strings: Variable condition, but operable. - Bow: If a bow is included (most include bow, however, pricing does not include bow) it will be a variable condition ranging from fair to Good. Please see additional comments. - Case: All cases have been included at no additional charge. Cases will vary in condition from poor to Good. Please see additional comments. RENTAL DISCLAIMER: Rental: Instrument was rented more than once. All rental instruments were maintained and repaired by certified master technicians with 30+ years of experience. All rental instruments being sold were regularly maintained by a full time staff of professional technicians and are all in operable/playable condition. For many of our hundreds of rental instruments, pictures were taken of 1-3 instruments and represent many instruments of the exact same make, model and condition. Buyer should be aware that the picture in featured for their rental instrument may be that of the actual/exact instrument, or of an identical instrument of the same make, model and condition. For example, pictures were taken of 1-3 half-size Otto Bruchner rental violins in Good condition and were used to represent many other Otto Bruchner half-size violins in Good condition. Normal but varying wear and tear commensurate with the condition designation (0-3) should be expected but markings may not be identical to the ones seen in the picture. It is incumbent upon the buyer to read all notes and descriptions. You've been outbid to O****n! to YOU! You've been outbid to o****6! to YOU! You've been outbid to k****3! to YOU! You've been outbid to E****s! to YOU!